Concrete casting ...using 3D printed formwork. 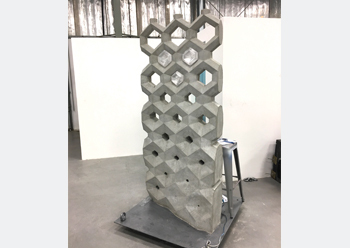 The ‘Sensorial Adaptive Concrete Screen’ showcases techniques that were once practised by skilled craftsmen but have not been revived through expert digital fabrication. It sheds light on 3D printing as the tool that will allow architects to become the master builders of the 21st century and enable direct control of the 1:1 production of their designs. Fahmi Al-Shawwa, CEO of Immensa, says: “This breakthrough signals the immense potential that 3D-printed formwork offers companies to significantly shorten and simplify their studio-to-site process. It brings proven concrete casting methods back to today’s building sites, renewed for the modern era and offering significant added value.